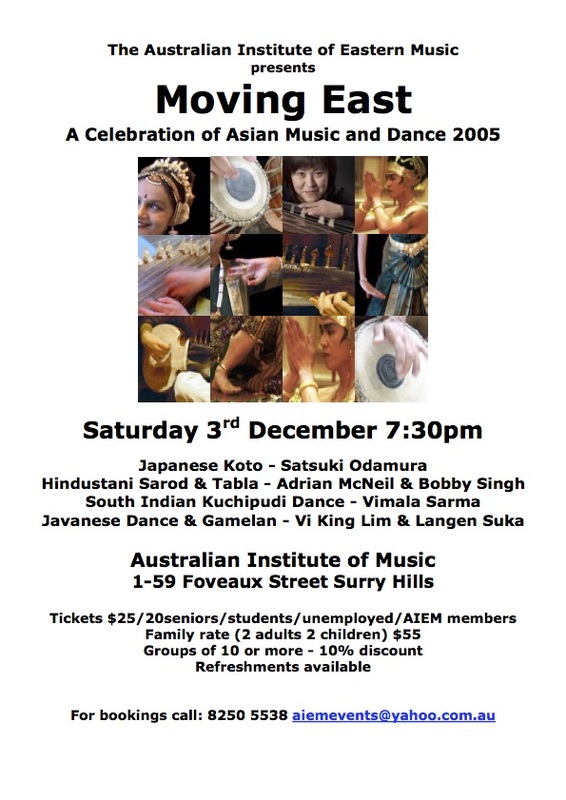 Performance featured a number of acts including Satsuki Odamura (koto), Adrian McNeil (sarod) and Bobby Singh (tabla), Vimala Sarma (Kuchipudi dance) and Langen Suka Sydney Gamelan Association. A well-known and much loved dance in Central Java, Beksan Menak Koncar was choreographed by the famous singer-dancer Nyi Bei Mintararas at the Mangkunegaran court in Surakarta. It derives both from the dance-drama theatrical form of langendriyan and the tradition of solo male dance depicting romantic infatuation. Here the character is Menak Koncar, a noble knight of the medieval Majapahit kingdom, who is ordered by the Queen to fight Menak Jingga, the regent of Blambangan threatening to overwhelm the kingdom through his influence and power. Menak Koncar’s sense of duty is so great that he forces himself to leave his wife behind, knowing that he will not return from the battle that awaits him. During his journey, he is constantly plagued by thoughts of his beloved and, imagining that he will see her, he prepares and grooms himself. The mood of the dance swings from dutiful resolution to romantic longing, from playful fantasy to desperate yearning, symbolising the internal human struggle between duty and desire.